Craig first joined Glenafton in November 2010 signed by then manager Mark Shanks. A vastly experienced defender ‘Southy’ played for 14 seasons at senior level with Clyde, Raith Rovers, Ayr United, Dumbarton, Brechin City and Stenhousemuir. While at Clyde and Raith Rovers he was capped 17 times for the Scotland U21 national side.Craig’s junior career began in 2009/10 with Linlithgow Rose before moving on to Pollok and then Glens that season. In five seasons at Loch Park the Glens were crowned the Super League 1st Division Champions (2011/12) , won the West of Scotland Cup (2012/13) and were Scottish Junior Cup finalists (2013/14). Craig was appointed manager of Arthurlie in October 2014 with former Glenafton colleagues Craig Potter and Stevie Kerrigan as his assistants. In January 2015 , he took over as manager of Glenafton following the resignation of Tommy Bryce, with Craig and Stevie also returning to Loch Park. Stevie stepped down from the club at the end of season 2014/15. In Season 2016/17, his first full season as manager at Loch Park, Glenafton Athletic won the fantastic treble of Scottish Junior Cup Winners, Super League Premier Division Champions and Evening Times Cup Winners Cup Winners. Craig first joined Glenafton at the start of season 2011/12 signed by then manager Darren Henderson. A versatile player in defence and midfield Potts joined Ayr United in 2002/03 before heading for the USA and four seasons at Hartwick College. On his return to Scotland he had spells at senor sides Airdrie United, Clyde and Dumbarton. He joined the junior ranks with Cumnock Juniors before moving to Dalry Thistle and from there to New Cumnock. In two seasons at Loch Park the Glens won the Super League 1st Division Championship and the West of Scotland Cup. Craig moved to Kilwinning Rangers at the start of season 2013/14 and had a spell at Troon before teaming up with Southy at Arthurlie. In Season 2016/17, his first full season as assistant manager at Loch Park, Glenafton Athletic won the fantastic treble of Scottish Junior Cup Winners, Super League Premier Division Champions and Evening Times Cup Winners Cup Winners. As goalkeeper with Benburb Juniors he saved two penalties in the shoot-out when the Bens defeated Port Glasgow Juniors in the West of Scotland Cup final of 1982/83. He went on to co-manage the club with Bens’ winger Eddie McKim and the pair steered the Tinto Park side to the Central League B title. Billy later joined the management team at Renfrew Juniors and in season 2000/01 the club won the Scottish Junior Cup; Billy managed ‘Frew when they played the Glens in the Premier Division in 2003/04 and 2004/05. He joined the coaching staff at Johnstone Burgh and had a couple of spells at the Keanie Park side before taking up a coaching role at Arthurlie in 2012. Billy was goalkeeping coach at the Barrhead club when Craig McEwan joined as manager in October 2014 and took over the role of interim manager when Southy and Potts returned to Glenafton in January 2015. 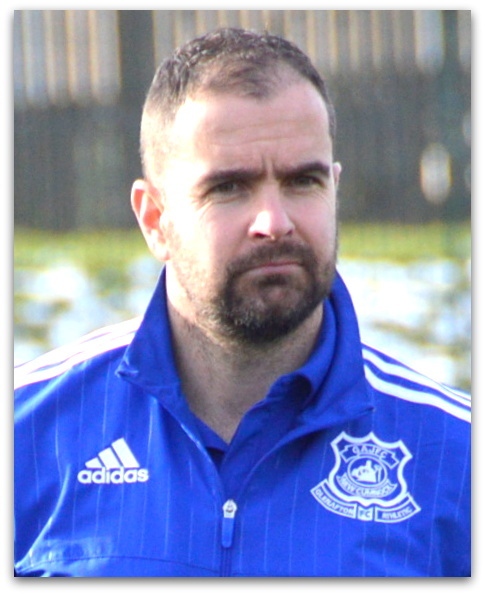 He joined Premier Division side Kilbirnie Ladeside as goalkeeping coach with the Blasties winning the Ardagh Glass Sectional League Cup at the start of season 2016/17 and by the end of season would pick up three more medals – Scottish Junior Cup Winners, Super League Premier Division Champions and Evening Times Cup Winners Cup Winners. Michelle joined the Glens at the start of season 2016/17 having been physio at Irvine Meadow last season. She began her career in the Juniors with Arthurlie in season 2006/07 then managed by former Glenafton player and manager Gary Faulds. The Barrhead side reached the Scottish Junior Cup semi-final that season only to lose out to eventual winners Linlithgow Rose, however a winners medal came her way in season 2008/09 after the ‘Lie won the Central Sectional Cup winners. Michelle was physio for her hometown team of East Kilbride and had a short spell at Blantyre Vics. She added to her medal haul in her first season at the Glens in their treble of Scottish Junior Cup Winners, Super League Premier Division and Evening Times Cup Winners Cup .